The second installment of the thrilling maritime adventure; two mighty empires battle each other for control of the high seas. Atticus is the young captain of the Aquila, the flagship of the attack fleet of the Roman navy. But his commander is a young upstart whose position has been purchased rather than earned. Bound to obey his inexperienced commander's rash orders, Atticus sails straight into a carefully-laid trap. In the battle that follows, it is only by defying his commander that he can pull his men back from the brink of defeat. But Atticus will pay a high price for his defiance, and, as he is summoned to Rome, he realises he has created a powerful enemy. And, despite his friendship with Septimus, a Roman centurion, Atticus is dangerously unversed in the politics of the Roman senate. So, Atticus finds himself facing battles both at sea against an ever-more ferocious enemy and on his own ship by those close to home who want their revenge. 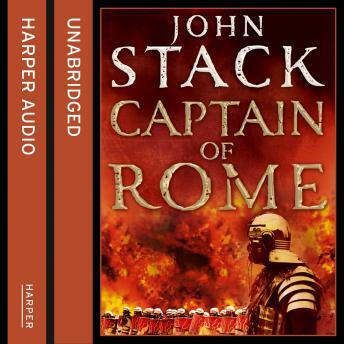 Culminating in one of the greatest sea battles of classical times, Captain of Rome is a stirring and powerful novel and John Stack is a born storyteller.